Once again, the RNZ news packages from the US and UK this morning underlined the striking difference in the treatment of the Pulse night club killings in Florida and the murder of the British Labour MP, Jo Cox. From day one, the Miami shooter has been described as a terrorist, and his self-identification with Islamic State extremism has been taken at face value – despite the apparent lack of any previous interest in Islam. In stark contrast, the motives of Jo Cox’s killer, Thomas Mair have been variously attributed to “mental health problems” and to “racism” – despite his prior contact with extremist groups and his courtroom outburst that his name was “ Death to traitors, freedom for Britain!” The role that the virulent hate rhetoric of Britain’s anti-immigrant political organisations played in Mair’s radicalisation have been marginalized in the media discourse, if not ignored entirely. This impulse has been evident from day one. When the Guardian began to discuss the politics of a murder that was clearly intended as a political act, many readers accused it of exploiting the tragedy. Yet when Islam is involved, such ‘exploitation’ is automatic. Theoretically, the word ‘terrorist’ is colour blind and creed neutral. It is a term for violent actions in the service of a political agenda. Yet in practice, it is applied much more readily – if not solely – to violent actions involving Islamists. As a result, the “racism” in play here does not reside solely in the actions of Mair and his despicable mentors in Ukip and other anti-immigrant organisations. Racism is also evident when we reserve “terrorism” solely for occasions when people with Middle Eastern names and sympathies attack white people, but shrink from using it when white people – Thomas Mair or Timothy McVeigh – attack other white people for political reasons. Basically, lets stop treating ‘terrorism’ as being synonymous with ‘Islam.’ It isn’t. On the brighter side, some Britons are reportedly reacting to Cox’s murder by recoiling from the anti-immigrant rhetoric of the “Leave” campaign. Meaning: the recent poll surge for the ”Leave “ option may have crested. Good. To put it mildly, this is not a restful time for the European Union. On Friday morning (NZ time) the EU will find out whether British voters really have chosen to try and turn Great Britain into a hopelessly utopian (and much whiter) version of Little England. That’s not all. Three days later, on Sunday June 26th, there will be an election in Spain, the EU’s fifth biggest economy. Currently, a left wing party – formed only three years ago to fight against the EU’s policies of economic austerity – seems to have the best chance of heading the next Spanish government. Note that I said “chance.” Nothing is certain. Last December, the Spanish elections ended in gridlock, and it could easily happen again on Sunday. Yet beneath the apparent gridlock, a seismic shift has occurred. Ever since the overthrow of the Franco dictatorship in the early 1970s, Spain has been dominated by two major parties – the right wing Peoples Party (PP) and the left wing Socialist Workers Party (PSOE). Last December, that mould got broken – the share of the vote that PP/PSOE commanded fell from the mid 70s to barely 50 per cent. Two new parties – Podemos (on the left) and Ciudadanos ( on the right) received widespread support nationwide as many Spaniards ( especially among the young) cast a vote of no confidence in the corrupt, austerity-driven and PP-led government of Mariano Rajoy. Unfortunately in December, none of the possible combinations of these four players could create a coalition able to form a government. So on Sunday, the voters will try again, in another election. Falling into third place would have dire consequences for PSOE. The party would have to choose which way to veer: left towards Podemos and IU, or right towards Ciudadanos and PP. Either side is likely to need the Socialists’ support in order to elect a government, so the party could opt to block both sides by voting against them and forcing new elections. That would, however, be extremely unpopular. Whatever they choose, the Socialists would lose their central position at the political table. This has been a remarkable resurrection for Podemos. Only a few months ago, Podemos was being wracked by conflict between its leader Pablo Iglesias, and its organizing genius, Inigo Errejon. A new Metroscopia general election poll published in El País on Saturday evening showed the Popular Party losing up to 10 seats, down from 123 in December to 113-116. 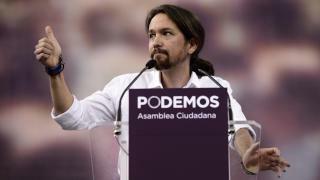 Unidos Podemos, the joint Podemos-United Left electoral list, advances to between 92-95 seats, a gain of up to 24 seats compared to their combined total of 71 in December, and 10 seats clear of the Spanish Socialist Party (PSOE) in third place on 78-85 seats (compared to 90 in December). Two possible two-party coalitions come close to or just over an overall majority in the poll: UP-PSOE (170-180 seats) and PP-PSOE (191-201 seats). A PP-Ciudadanos minority government would also be possible (150-157 seats) if the PSOE abstained. Abstaining would not get PSOE off the hook, since it would still be the enabler of a neo-liberal minority government led by the corrupt old PP of Mariano Rajoy. Since democracy was restored nearly 45 years ago, Spanish politicians have not been noted for their readiness to horse trade and to compromise. It will therefore probably take some time after Sunday’s vote for any clear outcome to emerge. Meanwhile, its almost possible to pity the bureaucrats of Brussels….In a week’s time the EU could be facing the fallout from (a) a Brexit and (b) a government in Spain led by Podemos, the former close friends of the Syriza party that led what almost became a Grexit, only a couple of years ago. And here’s this week’s number one hit song in Spain. A remix by a French DJ, and in English, of imported goods from Australia. This is the real European Union…. Mair was a long time supporter of neo-Nazi groups. The Southern Poverty Law Center records him ordering materials from US neo-Nazi group the National Alliance in 1999. Chavez/Venezuela money to podemos was the main reason for its success. There are people that don’t understand how bad communism is. @Malcolm So was the Queen of England. Most of the banker placed world ‘leaders’support Nazi NWO philosophy.